Use Street (Spigot) x Barb/Inserts where you want to use flexible tubing. More professional look than white Schedule 40 PVC. 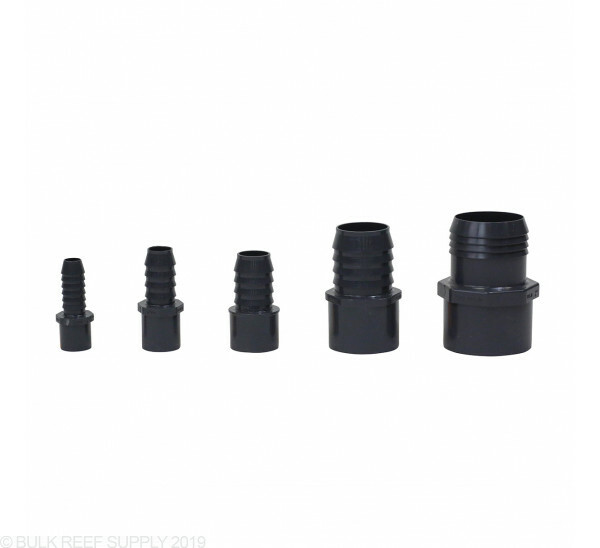 This street/spigot barb connector is great for converting plumbing fittings like gate valves or check valves to work with flexible tubing, or when you want to use flexible tubing straight out of a bulkhead with a slip connection. 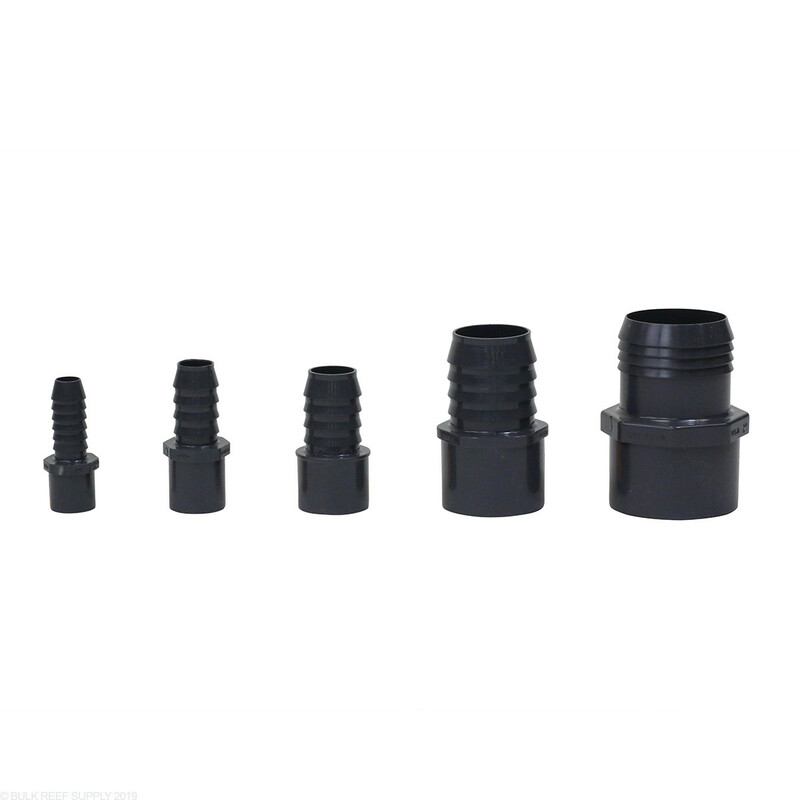 Street/ Spigot adapters have the same outside diameter as pipe, so they connect directly to fittings without the use of an additional piece of pipe. This works well when used in conjunction with a properly sized slip fitting. Please note that this will not fit the inside diameter of a pipe. Twice I tried to get these from BRS in 1" on the ID to fit 1" pipe and both times the ID is not 1.3" (actual size? on the ID to fit 1" pipe. I was using this to connect to my Sicce return pump. The pump camp with two threaded barb fittings. The one that came with the pump fit snug into the tubing. This one here had too much space. I tried to clamp it down, but still to much space. I used the braided nylon tubing to connect to this barb. I heated some DI water in a glass container and used that to soften the tubing, and put some silicone lube on the barb. The tube slipped on the barb very easily. Once cool, I could rotate the tube on the barb with some force, but it was very difficult to remove (as I would want). When I had to refit one connection, I actually wound up cutting the old tube off by slitting it rather than trying to pull it off. That would work in the Cepex ball valves! Have a great day! I need a Barb fitting to connect a 1.5" flexible hose to a 1.5" pvc pipe. The barb should have a smooth end to accept the 1.5" pipe. Please let me know what item to order. We do not have the exact fitting available. You can use the 1.5" spigot x barb and a 1.5" slip x slip coupler together to create the effect. Feel free to let us know if you have any further questions! My overflow has 2, 1" drains (Eshopps Eclipse L). What diameter pipe or tubing is recommended for run to the sump? I would use 1" pipe/tubing or larger to maintain the manufacturers flow rating on this overflow. Reducing the size of the drain lines will significantly reduce the amount of flow it is able to handle. Can I use this with a regular white ball valve I bought at Lowes, or do I have to use this with a gray ball valve? I'm saying white and gray because I'm not sure if it's still schedule 40 or 80. The sch80 and sch40 are interchangeable, though you'll find that the sch80 components like the cepex ball valve are of a lot higher quality then the typical white sch40 bulkhead from the hardware store.